I've been to see Julian Assange at the Ecuadorian Embassy several times, mainly when Rafael Correa was President and the Embassy felt like a liberated space. A few weeks ago I met him again. By now Correa's successor, Lenín Moreno, had capitulated on every level to the American Empire. The Embassy became a prison and Assange's health deteriorated. He was in no doubt that Moreno had been asked and had agreed to expel him from the Embassy. The US demand for extradition was no longer a secret. 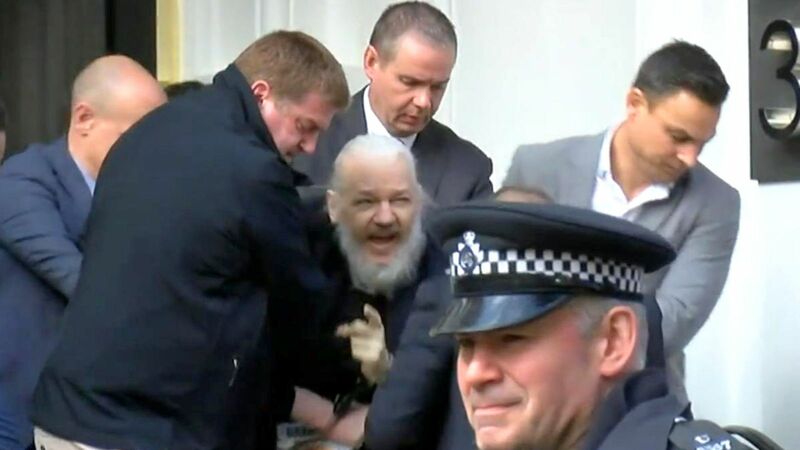 The Embassy handed him over to the British police earlier today. Wikileaks has been exposing all this by publishing classified documents that shine a light on the real reasons. It is an astonishing record. Till now WikiLeaks has published almost 3 million diplomatic cables and other US State Department records, comprising some two billion plus words. This stupendous and seemingly insurmountable body of internal state literature, which if printed would amount to some 30,000 volumes, represents something new in the world. This is where the Internet becomes a subversive force, challenging the propaganda networks of the existing order. Assange and his colleagues made no secret that their principal target was the American Empire and its global operations. The response of US institutions has been hysterical and comical. The Library of Congress, blocked Internet access to WikiLeaks. The US National Archives even blocked searches of its own database for the phrase “WikiLeaks.” So absurd did the taboo become that, like a dog snapping mindlessly at everything, eventually it found its mark — its own tail. As Julian Assange pointed out: "By March 2012, the Pentagon had gone so far as to create an automatic filter to block any emails, including inbound emails to the Pentagon, containing the word 'WikiLeaks.'" As a result, Pentagon prosecutors preparing the case against US intelligence analyst PFC Manning, the alleged source of the Cablegate cables, found that they were not receiving important emails from either the judge or the defense.